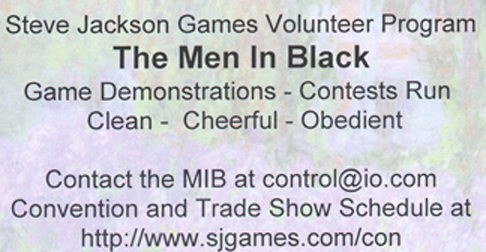 The Men In Black are the volunteer arm of Steve Jackson Games (SJG). SJG is the games company responsible for such delights as GURPS, In Nomine, Illuminati (Deluxe and New World Order), Dino Hunt, Ogre, Tribes, Chez Geek, Knightmare Chess, Tile Chess, Car Wars, Hacker, Toon, Killer, the Awful Green Things from Outer Space, Munchkin, Frag, Proteus, Chez Dork, Cardboard Heroes, and many more. Check out their webpages for more details about these games. The Men in Black (MIB) are responsible for promoting SJG products at game conventions, game stores, games clubs, schools, and anywhere else they can. MIB operations are coordinated online through the MIB mailing list and other stuff classified for nonmembers. Need to contact the MIB? You can reach me or Control just by clicking. I can't tell you where the main MIB webpage is...you're not cleared for that. Still curious? Try this. The first half of 1998. The MIB page for Worldcon '98. Of course, MIBbing is not the only demos done at these conventions. You'll also see other cool stuff that pictures were taken of, notably Cheapass Games. Propaganda...er, advertisements for the Men In Black. One of the business cards I made up for the MIB's. 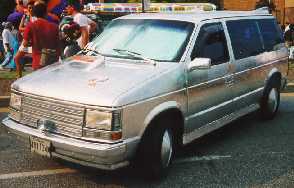 This was one of the vehicles displayed at the Art Car show at Artscape '98 in Baltimore. No, I don't know where they found that much tinfoil. This, I think, should be the fleet vehicle prototype for the MIB. I hadn't changed the size of this picture in a while; I just realized how freakin' huge it was, so now it's thumbnailed. Enjoy! And, of course, what site would be complete without an upcoming schedule of where you might find your friendly neighborhood MIBs? Places where I'm sure we'll be going will have "Positive MIB Presence" listed in their descriptions. Some of this is clearly cribbed from the Convention website at http://www.sjgames.com/con - most of the rest comes from Jenga's convention listing at http://go.to/conventions...so anyone who can find me a better con site listing gets a prize from me. Email me if you find something useful! M. Foner's Games Only Emporium (717-761-8988) in Lemoyne, PA. Since nobody else claimed it, I'll liaison for this one. this, and anything else along those lines, nailed down ASAP. able to cover both) and name a con liaison ASAP. Everything below this line may or may not be active any longer. Since I am no longer NERD, it is up to the current administration to decide which of this to keep and which of this to file in the circular file. And, of course, some Sooper Seekret information for my MIBs which I shall hide from the public by the use of fatally flawed HTML. You can't see this, because it's not here. YNCFT. 1) Keep us informed on where you are and how to reach you. Check the website if you're concerned about its accuracy. 2) NY controls North NJ; Philadelphia controls Allentown & South Jersey. DC controls NoVa and Maryland. This will continue until someone demonstrates that they wish to become CL in a region lacking one. It might become time to split NY into multiple cells, the way that Pennsylvania has become. Anyone interested in taking a position as CL? Let me know. 3) Need MIB stuff, like shirts, pins, or a kit? If I don't know about it, I can't help you. If you didn't get stuff, please let me know so that I can bother Control. If your contact information isn't right, then you're not going to get stuff. And if you haven't yet earned enough MIB points, you're not eligible to receive a kit. Get back to work, slacker! 4) Reports: file your reports, get your points. If I don't know that it happened, I won't be able to assign points. If there's a problem with recent points, let me try to solve it before barraging Control with problems, please. If points aren't reported promptly, they might not be allowed. 5) Recruiting: when a recruit of yours earns 5MB, you earn 2MB. If your recruits work out, you get paid for it (with a bit extra from moi.) Cool, eh? the convention organizer to do it, it's even better. Recruiting is on tap. Bring me new, active, dynamic people! To wit: When you recruit, and your recruitee earns 5MB, you'll get 2 from SJG. I'll give you one as well. Also, infiltrating or starting a college gaming club is worth points to me. I'll give you points for demos you run to college students on campus...but only for *planned* demos. Recruiting MIBs in the club is worth the bonus as above. And starting a gaming club and recruiting MIBs from that is its own reward, but I'll give points for doing cool things with it. I have discretionary points to burn. Bring me a gaming club at a college or a local area and things will be really nice for you. I am actively resisting, with every fiber in my body, kicking out MIBs who aren't earning 10 points a year. Don't make me do so by doing your work. If you claim a Store Liaison position for a store and then don't send reports, the store is up for grabs...so someone else can take the job if they do the work. As far as I've seen, no bickering going on. Yeah! I want to *clarify* a few things from the charter for our region. (No, they are not really negotiable, but I will remain open-minded to questions and suggestions.) As always, feel free to seek further clarification. This is in effect as of now. Ignorance of the rules is no excuse. - Conventions: Certain events are more of a game day than an actual convention. Although it's easier to arrange demos at these events, you will *NOT* get the bonus points of being a Con Liaison/Chair, even if you arrange slots for other MIBs. It's like the difference between a Store Liaison and a Game Club Liaison. These are noted as such in the Convention/Game Day section of each month's RD Report. - Reporting for Conventions: Send your *formatted* report to the appropriate Con Liaison/Chair. That person will send the *formatted* point report to the RD (me). They will /then/ send the collected *demo reports* for the convention, appropriately formatted, to the MIB List. Do NOT send either until you are ready to send them both. - Store Liaison: The store has to be in your area, and you should *physically visit* the store for the month you request points. - Non-Store Demos: You get credit for doing demos at Game Clubs, Classrooms, Rec Centers, etc. You do *NOT* get credit for gaming with your friends, or even someone else's. Here's a good, simple guide: "If you can put up advertisements for people to come to the demo (and you should), then it will likely qualify. If your host does not want his number/address posted all over, then have fun (because that is your only reward)." - Reporting for Non-Convention Demos: *Each* demo report should be sent /separately/; do not add them together. (But, you may wait until the end of the month to do them if you so choose.) Send your *formatted* point report for the demo to the to the MIB List. - As the RD for the NE Region, you should ask me all your MIB-related questions. If I'm not sure of something, then *I'll* ask Control. That's part of my role. - I encourage you to *request* to be a liaison/chair for events, but the final decision is mine. Just so you know, I will try to give the opportunity to those with fewer points and/or less going on; I just want to give them the opportunity. However, once that opportunity has passes and someone else has it; it's too late, unless the other person *voluntarily* steps down. There are occasionally events in which someone is a clear candidate for liaisoning, (e.g. they're on the con staff) and that person will receive preference over other candidates. My apologies, but that's the way it should go in order to aid appropriate reporting. Let me know if you also need clarification/reminding on how to properly format your reports. You didn't see a thing, as You're Not Cleared For This Level of Information.